adjective, e·bay rar·er, e·bay rarest. Item for sale online that has been described as ‘rare’ that the seller has made no attempt to verify if it is or is not, and is largely a commonplace item. An item being sold online, or talked about online that a person wishes to imply has greater desirability or value than it actually does, and thus describes it as ‘rare’. An item someone has acquired that is a commonplace item that they found hard to get hold of quickly, due to the item no longer being manufactured and few or no owners were at the time selling second hand across the world. Something that someone is going to be, or thinking of taking to an antique appraiser to find out ‘what it is worth’ – after they saw one on ebay sell for “Squllions“. Rare you say? I guess those prices are cheap then! It seems that if something has been hard to get for a person, then it somehow becomes ‘rare’. Rare is often equated to meaning ‘valuable’ in collector-speak, but in reality this isn’t actually true about such items. A friend of mine used to run a record store that specialised in hard to find recordings. I used to hang out in his shop from time to time to just talk, and listen to whatever interesting stuff he used to find. He once ran a radio program on Triple Z FM (radio) called ‘Galactic Zoo’. It wasn’t unusual for people to come in off the street and sell him interesting recordings that they had, or to ask him advice on the value of various recordings in their collection. On a near daily basis someone would come by to tell him that they had a copy of ‘The Beatles: Sgt. Pepper’s Lonely Hearts Club Band’ on vinyl, and they wanted to know what it was worth. For those that aren’t aware, that album in vinyl form sold 40 million copies, and has been re-released several times over. It is one of the greatest selling LPs ever. He was always polite when he answered the question, and pointed out to them that it was essentially valueless, except for the first pressing run version. They would almost invariable ask ‘How much for the first pressing’, and then be disappointed that it was pretty much the same as what you pay for the modern CD brand new. Pop onto Ebay now and it isn’t hard to find people selling copies an exorbitant rates. They aren’t selling, but it seems to perpetuate the idea that the recordings are worth something. Despite there being 40 million of the things out there, I personally don’t see many of them about the place. Even on ebay there’s more novelty items related to the album than there are actual copies. 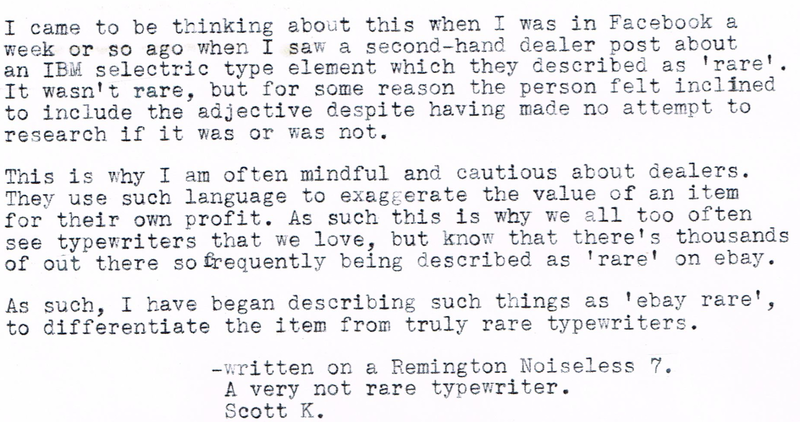 November 30, 2013 in collector, ebay, ibm selectric, rare, Remington 7, type element, typecast, typewriter. It's funny that the word is bandied about so easily these days. Similar to how every act on “The X Factor” or “Australia's Got Talent” gets a standing ovation after they finish their act. Was a time when you had to have a body of work under your belt before you got a standing ovation. Charlie Chaplin gets a standing ovation at the Academy Awards and is given a lifetime achievement Oscar in the early 1970s? Yes, he deserves it. have a friend who has some limited edition Japanese pressing of the entire Beatles catalogue. A collector offered him ten grand for it. THAT is 'rare'. Something tells me that these folks think they have a rare typewriter because they've never seen one in a department store window. There's a SM2 on eBay at the moment with a starting price of $1,200.oo. I noticed that SM2! I had a bit of a chuckle at “It has barely been used”. Actually, the SM1-5 machines tend to hold up really well over time, and seem to freakishly keep their condition. As for the X factor standing ovation, we seem to have come to the point in time where we celebrate mediocrity more than we celebrate refinement – as long as it seems to be someone 'just like us' that is 'having a go'. I was amused during the week to see a newspaper article trumpeting that the recent X-Factor winner has done something that no other winner has done before: Their second single was a hit, not just the first. Novelty wearing off a bit slower? And my kids wonder why I want to buy so many boxed set DVDs. There used to be much more to choose from on TV when we just had four channels plus SBS. And a whole lot less “reality television” which puts a lot of screenwriters out of work. Honesty is “rare” on Gumtree these days. The number of times I have gone to look at a typewriter that was advertised as “in excellent condition” and it turned out to be anything but. These people don't seem to realise that you are actually going to inspect the item. These days, when it takes just a minute to check the actual rarity of any object, there's no excuse for calling something rare when it's not. That is just, at best, willful ignorance — which amounts to a lie. I wholeheartedly agree. Nowdays there's so much dross that I simply just don't watch a lot of TV. Either that, or leave it sitting on ABC all night, as it is about the only safe bet that there isn't going to be some 'reality TV' garbage. Gumtree seems to be a whole world of its own. I agree! There's been some bad behaviour there. Agreed. You might not be able to find every one ever made on the internet when you try to look, but there's enough information out there to tell you what actually is rare, and what isn't. I agree with Steve. My one Gumtree experience was the Facit 1620 I promised you Scott (You'll have to wait until Christmas or March now!). I was alerted to it by Ron Bowker in England and it was listed in Canberra. Anyway, the seller was completely nonplussed when I insisted on testing it and found the carriage was jammed rock solid. My eldest son's girlfriend's best friend's father, an ex-Facit technician, fixed it for me. In terms of buying or listing typewriters on eBay, especially in Australia, I consider it fair to call a hard-to-find machine rare, in the sense that you very rarely come across one for sale in this country. I did so on two Brazilian-made Olivetti portables (Roma and Tropical) which were never sold in Australia at the time they were made. 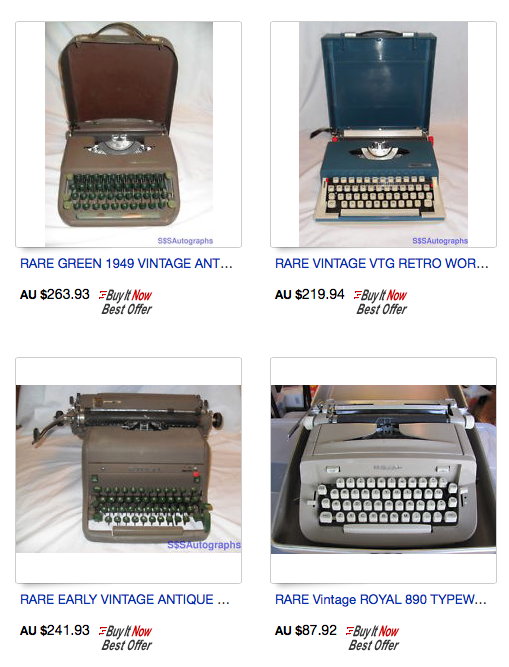 I had never previously seen either listed on Australian eBay, and I do keep a close eye on typewriter listings here. Anyway, a Californian couple who are starting a collection snapped them up. I note that later Georg Sommeregger said these models are also hard to find in Europe, and he had been looking for one. So I am totally at ease with calling those “rare”. At one time, not so long ago, I tried to collect as many different variations of the Safari/Sahara/Caravan as I could, then gave up when I realised just how many there are. While the Safari itself, both as a Royal and an Imperial, might be fairly common in Australia, is it not reasonable to consider as Caravan a “rarity” here (and even elsewhere)? That's Rob Bowker, sorry. I should had added that I knocked the price down from $50 to $20, knowing full well it could be fixed by Jim the Facit man! I see your point Robert. There are some re-branded machines that are very thin on the ground. And to be honest, a lot of those really are worthy of being called 'rare' – even if they are just a re-variation. Then again, many of the Sears and brother machines were so short lived, but are significant by their abundance of variations. AH! I'm eager to see that machine. Honestly, I expect there to be failures with machines that I see online. In fact, I revel in it. But of course if it lets me talk the price down, I'm all the more happy for it to be broken. I just went through all of those links. WOW! What an eye opener!